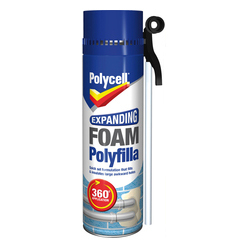 Expanding Foam Polyfilla is ideal for filling and sealing awkward gaps, hollows and cavities. It shoots liquid foam deep into cavities, creating a long lasting seal, which insulates against heat, sound and moisture. Suitable for inside or out, it can be easily trimmed and sanded ready to be painted, filled or plastered. Contains a CFC – free propellant. Shoots liquid foam deep into cavities, it expands to make a long-lasting seal and insulates against head, sound and moisture. Ideal for filling and sealing awkward gaps, hollows and cavities. Can be painted over, filled or plastered. Tools Gloves, water spray, knife. Ensure surfaces are clean and free from grease and loose material. Do not apply in very cold or hot (Below 5 or above 25 degrees) conditions. Ensure good ventilation. Cover furniture, carpets and surroundings areas before use. Mask off wood and brickwork. Moisten surface to help the foam cure and expand, e.g. use a plant spray. Remove cap carefully, holding can away from face on a flat horizontal surface. Shake can vigorously approx. 20 times to mix contents. Select applicator nozzle, dependant on bead size required and carefully screw onto valve, taking care not to activate the valve. Do not over-tighten. Hold can upside-down away from face. Apply light pressure to nozzle to test. Vary pressure to adjust rate of foam. Start filling at the lowest point shaking can from time to time during use. 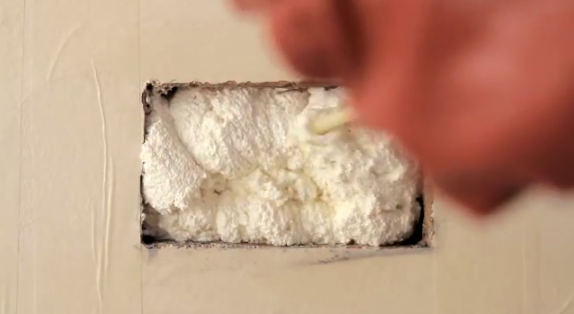 If using more than one layer of foam, spray lightly with water between layers. Do not overfill – the foam will expand 2.5 times the initial volume extruded. Foam will be tack free in about 20 minutes. It can be cut, sanded, plastered, or painted after twelve hours and will be fully cured in 12 -24 hours. If exposed to sunlight, the foam should be painted or coated.